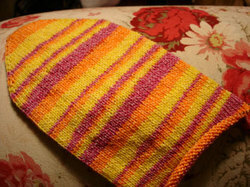 savannahchik knits: Sockapalooza is on its Way! I didn't know that about yarn weights. I was just weighing sock yarn the other day. But I had three skeins of Sockotta and only one was about 2-3 gms lighter. 'Course they came from different places. I'm using that colorway too! Looks like lots of us have good taste in sock yarn, huh? I'm really liking the bright colors, it looks like summer to me. Such bright, wonderful colors!! Puts the "palooza" in sockapalooza! I have that yarn. I just haven't used it yet. I almost bought another skien of it recently. I am hoping to meet you at Maryland Sheep and Wool. Hey, what a great idea to measure your yarn by using a postal scale, I want to try that. Beautiful colors by the way, can't wait to see the finished sock! Your socks are beautiful! I hope the ones I'm making turn out as well. I've been doing that with a lab scale at work. Of course, a postal scale would save me the trouble of having to use a plastic bag between the yarn an the scale. Even if I clean it, I know the yucky things that have been on that scale before and I want my yarn away from them.